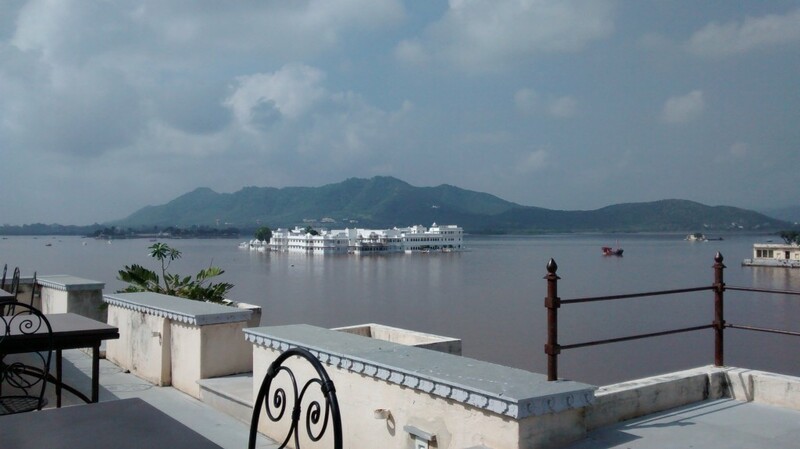 Kankarwa Haveli is a heritage hotel on the banks of Lake Pichola in the Lal Ghat area. Mr Janardan Singh and his son Divyarishi have restored their ancestral home into a hotel. They have maintained the traditional charm of the original Haveli but refurbished it with modern amenities to appeal to the international audience, which I felt is a very good mix. We stayed in the Deluxe Lakefront Suite which had an amazing view of the Lake Pichola and the opulent Taj Lake Palace. The room was large, well lit and ventilated and had a very romantic air about it. That is the magic of a Lake facing room and worth spending the couple extra bucks (although we received a free upgrade!). It had a separate sitting area overlooking the lake which was a plus. The bathroom was white and spotlessly clean with modern European fittings. The rooms are done up really well and no two rooms are the same in terms of size and decor. Simple, classy interiors with clean and comfortable bedding. 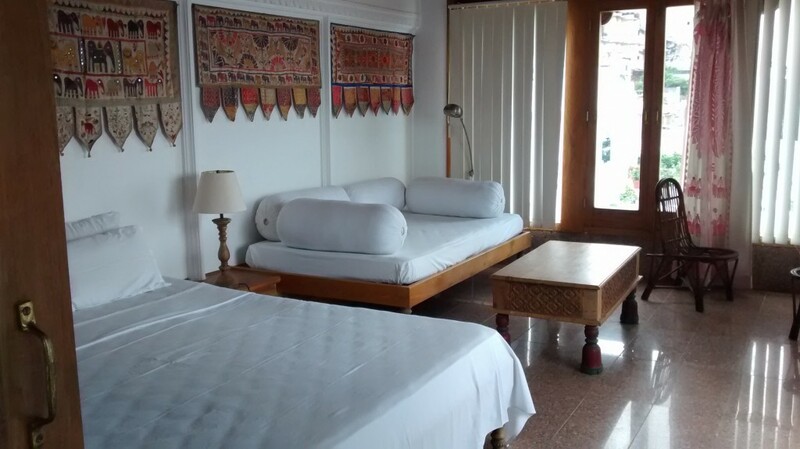 The partial lake-facing rooms also have a decent view of the lake with cushioned sitting area near the window. Divyarishi is more than willing to have a quick chat and help you with directions and things to do. They can arrange a car or if you wish bicycles to get around Udaipur. Breakfast served at the rooftop was non-greasy and appetizing. You can choose anything from the menu even if already paid for with the room. Although it wasn’t an issue for us, the staff speaks very little English and it can get difficult if you need help when the owners are not around. The stairs are huge and steep which can be difficult to climb and risky for old persons or young kids. They do not have room service. 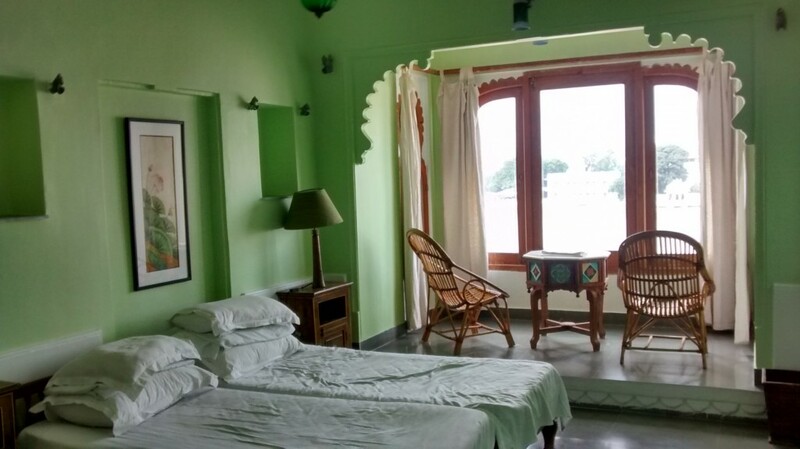 We would have loved to sit in the comfort of our rooms with a beer or even a hot cup of chai. Perfect for a romantic stay and if looking for privacy. To plan your thoughtful and economical trip across Rajasthan, contact us.